Save The Last Iceberg Today On Cheerful Ghost Games BBS! Today we're launching a new game on the Cheerful Ghost Games BBS called Iceberg 2 Wrath of Don by Taylor Buchheit. If that name rings a bell it's because Taylor is 50% of the Game Devs Podcast, a local Podcast all about Indie game development. Taylor and I have been talking about the games he's been making and Iceberg 2 seemed like a good fit to include on our BBS lineup. It's a fun top down arcade styled game that harkens back to Robotron as you try to save an Iceberg from global climate change. Find Iceberg 2 Wrath of Don at our Games BBS Link below or click the "Games" tab at the top of the page. We think Open Source is pretty awesome and as such Taylor was cool enough to release the source for Iceberg 2 on GitHub and you can find that on the Iceberg 2 link below under "View Source on GitHub." I want to thank Taylor for letting us include the game on our BBS and make sure to checkout the interview below. jdodson: Can you explain to everyone what Iceberg 2 is and your inspiration for creating it? Taylor : I made Iceberg 2 as part of the 2018 Low Res Jam which constrains developers to using a 64 x 64 resolution. 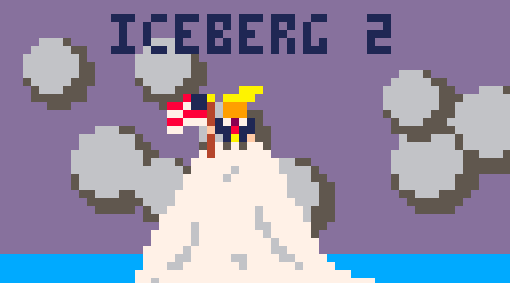 Iceberg 2 is the sequel to the first game jam game I ever made, Iceberg. In Iceberg, players look after a melting iceberg. Their only option is to continue watching it melt, or close the game, thus saving the iceberg from global warming. Iceberg 2 follow a similar premise, but this time the player controls a scientist who must collect carbon credits to combat climate change and heal the iceberg. His greatest foe, Bad Don, is chasing him around, attempting to corrupt him, denying that climate change is real and dooming our planet. In our current political climate, I am becoming increasingly frustrated with the blatant attack on science, and specifically on climate change. I believe that games have the power to move people, so making games with a message is really important to me. This game is a direct attack on climate change deniers and hopefully prompts players to think about the devastating effect that denying scientific evidence has on our planet. jdodson: For any aspiring game developers, what tech did you use to create Iceberg 2? Taylor : Iceberg 2 was made in the Pico-8 fantasy console. It's a really neat game engine that can run on just about any computer, including a raspberry pi, but still has surprising power. If someone is learning game development and wants to fully understand concepts like the game loop, how animations work, etc, I think it is a great engine to use. jdodson: You and Rett partake in the Game Devs Quest Podcast, a show I listen to regularly. What's your favorite show you've recorded so far and has anything surprised you about how the show has progressed over time? Taylor : This is a tough question to answer! At this time, we have released 80 episodes, so there are many to choose from. I really enjoyed when we first started the podcast because we were hyper focused on sharing our experience learning game dev; we always had something we wanted to share from the previous week's progress. As we continued, the podcast evolved into more of a show about Rett and I's friendship and all of the challenges that come with pursuing our passions. Lately we have had some great guest game developers, and that is always a blast and a great opportunity to learn from others. A few episodes that are notable in my memory are Episode 26: One Percent Dota where we break down how much time we have spent doing things in our lives and the ten thousand hour rule, Episode 32: Shinkansen Edition where we recorded a podcast as we were riding a train in Japan, Episode 48: ManBeardGames where we talk to fellow gamedev ManBeardGames who teaches us the basics of shaders, and our most recent episode, Episode 80: Coffee with Butterscotch where we podcasted with the Coffee with Butterscotch podcast (one of our favorite podcasts to listen to). Overall though, it is really hard to pick a favorite because we have done so many episodes and have had so many great conversations (including several episodes with Jon Dodson of Cheerful Ghost!). In terms of being surprised about our progress, I'm surprised that we have continued to produce an episode each week for about a year and a half. I never would have thought that Rett and I had this kind of dedication to this project, but after hosting 4 game jams that yielded hundreds of games, starting a Discord server that now has hundreds of active game developers, and meeting so many cool people with similar interest via the podcast and twitch streaming, it has become an extremely enjoyable and integral part of our lives. jdodson: What are you playing right now? Taylor : I actually don't play many games anymore because I spend most of my free time either making games or programming. Recently, however, I picked up Shadow Tactics: Blades of the Shogun and have been completely consumed. Growing up, I was a huge fan of the Commandos series, and Shadow Tactics feels like a Commandos sequel set in Japan during the Edo period. I love games that give me nostalgia, and this game definitely brings me back. I've also been playing the Banner Saga, which was a little tough to get into at first, but is now very enjoyable. I love the hand drawn art style and the turn based fighting. jdodson: Are there any game developers or companies that you look up to? Taylor : One person who really inspired me to start making games is Eric Barone aka Concerned Ape, who made Stardew Valley. After playing that game and learning the back story behind how it was made, I started to believe that one person could make amazing games on their own. Other notable game developers I look up to are the guys from Butterscotch Shenanigans, Chris DeLeon of Gamkedo, Christer Kaitila aka McFunkypants, and so many developers that are a part of our community. All of these developers have a very positive attitude, not just towards making games, but in regard to living a productive, fulfilling, and good life. jdodson: Now that Iceberg 2 is out what are you going to work on next? Taylor : My next big project is developing a website for the Game Dev's Quest community. I'd like a full blown web application where our members can interact in more of a blog/forum like fashion as opposed to a real time IM environment with our Discord server. After I finish that, I plan to get back to a mobile game called Logger's Road I had been working on for about 5 months. In the game, you own a logging business and you must manage your forest in a sustainable way to be successful. jdodson: In Solo A Star Wars Story Han got his last name by way of an Imperial recruiter. Apparently because Han Solo had no family the Imperial recruiter wrote "Han Solo" on his application. So let's say in an alternate timeline you are the writer of Solo A Star Wars Story and you __HAVE__ to figure out a way Han Solo got his last name, what would that be? Remember a million nerds are counting on you! Taylor : Oh, wow. See, Rett is the creative writer, not me! How about this (I've gone through several different versions and all are terrible! ): When Han joined the imperial fleet, he was a practiced marksman. He ranked top of his class with a blaster, hitting nearly every bulls eye in his weapons course exams. He gained the nickname "Solo" because, as his classmates said, Han only needed one shot per enemy. From then on, he ditched his real last name and went by Han Solo. Taylor : If anyone would like to get started making games, it is like anything else, all you need to do is make the decision to start and practice as often as possible. Pick an engine, stick with it until you've made a bunch of really bad games, and don't give up! If you'd like someone to help you stay motivated along the way, check out our podcast and our community. You can join our discard at bit.ly/gdqdiscord or follow us on twitter @gamedevsquest. Best of luck on your own Game Dev's Quest! I like Taylor’s last name idea better than the one in the film. Totally agree. I was thinking he had it cause it was his parents last name but is that too easy? Honestly yeah. It seemed like an answer to a question nobody had asked.